UOU Result 2018 – releases on the official website of Uttarakhand Open University (UOU), www.uou.ac.in. The University will release the result after the examination gets over. The result will also be available in the study centre. Students can check the result of annual and semester exam through the online portal. To check the UOU Result students have to provide their enrollment and date of birth. Students can check their Main and Back Result through the same portal. The final year students have to qualify in all paper to get graduate from the university. If the student is not satisfied with the marks obtained in the exam then they can apply for scrutiny. The students can even download their mark sheet from the official website. Check the articles for more information related to UOU Result 2018. Latest: Uttarakhand Open University has released the result for December 2018. Also to check UOU Time Table- Click Here. The student not qualified in the exam have to appear in back paper/improvement exam. The student has to fill out the form for the same. For scrutiny, the student has to pay the fee and can only opt for two paper. 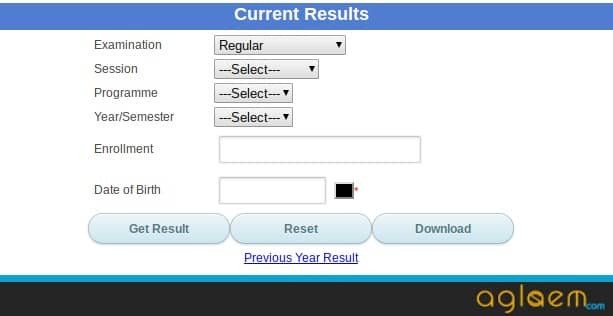 To download the result students have to provide their enrollment number. The enrollment number can be checked through UOU Admit Card 2018. Check the table for important dates. Result: Click here to download UOU Examination Marksheet online. How to Check UOU Result 2018? Click the provided above to check UOU Result 2018. Students can even follow the steps mentioned to check their Main and Back Exam result. Click on the link available in the Homepage to check UOU Result 2018. Current Result page will appear. Click the Download button to download the mark sheet. After the declaration of the result, the students of the final year who cleared all the paper will have to attend the convocation and they will get provisional mark sheet. The students of I & II Year will get admission to the next higher level. To get degree/diploma/certificate/provisional and duplicate marks sheet/Document verification students have to fill the application form. The students who failed or not satisfied in the exam can apply for the scrutiny of the paper. The students who failed in the exam or not satisfied with the marks obtained in the exam can opt for the re-valuation of the result. The students have to fill an application form for the same. The application form should be and submitted to the controller of the exam within the 30 days after the declaration of Result. The students can select max two paper for scrutiny. The fee for scrutiny is Rs.100 – per paper only in challan. The scrutiny application form along with fee challan and photocopy of Mark Sheet should be sent to the controller of examination Uttarakhand Open University. The qualifying students in the exam have to application form fill II Year / Semester onwards to continue their studies. The application form is available on the official website. Students can even download the application from this page. Check the application form from this page. Click Here to download the Application form for admission in II Year/ Semester onwards. The final year students who have passed the exam will get their degree/certificate/diploma/provisional and duplicate mark sheet. The students who have passed in all subject can only apply. The get the documents students have to fill the application form. The application form is available on the web. To obtain the mentioned documents students have to pay in challan. The fees are as follow. The filled form with the fees is to be sent to Controller of Examination Uttarakhand Open University. Note: For Degree/Diploma/Certificate photocopy of final year mark sheet is to be attached with the application form. Click Here to download the Application form for obtaining Degree/Diploma/Certificate/Provisional and Duplicate Marks Sheet/Document verification.